Fraser Island has a number of settlements around the island where you can obtain supplies that may be necessary during your Fraser Island adventure. On the island you will find all the essentials including fuel, food, souvenirs and more, depending on where you are headed! There are five areas on the island where supplies are available: Eurong, Happy Valley, Cathedrals on Fraser, Orchid Beach, and Kingfisher. All destinations provide food and fuel, ensuring you are never far from the essentials. Eurong is found on the eastern side of the island and has a small store and bottle shop, bakery, bar, and restaurant. It also has many accommodation types around the settlement, as well as accommodation for several tours that spend their nights here. At the store you can find fresh produce, meats, fishing gear, camping supplies, beer, wine and spirits. It also has souvenirs, shirts, hats and extra supplies such as sunscreen that may be needed on your trip! Happy Valley is found north of Eurong and is another settlement where you can stock up on supplies. Happy Valley has a bar and bistro that doubles as a general store where you can get supplies such as groceries, snacks, alcohol, fishing gear, coffee, 4WD equipment, fuel and more. Cathedrals on Fraser is a campsite found on the eastern side of the island. It has a fully stocked convenience shop with groceries, a breakfast and lunch menu, snacks, tea, coffee, camping gear, tackle and more. The campsite also has a place to refuel and a bottle shop for any alcohol you'd like to purchase. Orchid Beach is found even more north of the other sites, past Indian Head and Champagne Pools. Orchid Beach only had one shop within the settlement where you can purchase fuel, bait, limited provisions and alcohol. From here you can also use a public phone and ATM, but the settlement has no restaurants or cafes. Kingfisher is the only settlement found on the western side of the island. The resort has an abundance of dining options, with three restaurants and four bars, and also has a general store where you can stock up on supplies. Here you will find groceries, alcohol, souvenirs, and more. Kingfisher is the only place that allows two-wheel drive on the island and is one of the landing points for the ferry. Even though there are resources on the island, it is recommended that guests stock up on what they will need before they come. Due to limited availability, you will find less variety and supplies are often at a much higher cost. 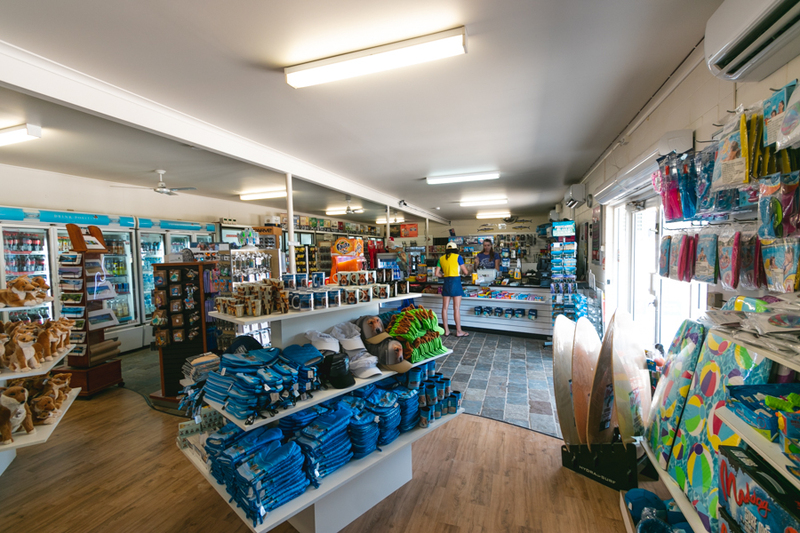 Shops and stores on the island are ideal if you've forgotten essentials or have run out of something and a great asset to the Fraser Island community. It's a good idea to carry what you can with you to ensure you will have what you want on your trip. Those planning their own Fraser Island adventure need to be self-sufficient and educate themselves on what they need to bring to the island beforehand. It should be noted that there is no pharmacy on the island so visitors should bring along all emergency supplies or medicines they may need. Can you take dogs to Fraser Island?